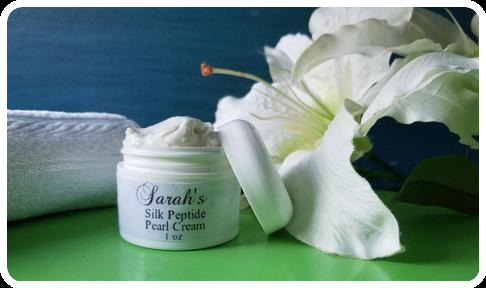 Silk Peptide Pearl Cream - The Ultimate In Anti Aging Luxury! 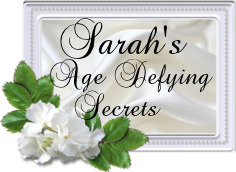 The Ultimate In Anti Aging Luxury! Silk & Pearls - What More Do You Need! Silk, Pearls, Vitamins A, B2, B6 C, & D & E, along with Pure calcium. - This posh lotion is fit for a Queen or King! This Ultimate Luxury cream is made from the absolute most luxurious, wonderful ingredients direct from Mother Nature. Made with REAL SILK and FRESHWATER PEARLS, finely milled. Personally formulated with the Highest Quality and content of Pearl Powder and Silk Peptide Powder for Peak effectiveness and efficiency. Treat yourself to a light but luxuriously rich face and body cream that helps nourish itchy, dry skin and maintain softness. Vitamin-Mineral-rich face cream restores essential nutrients to the skin, to help keep it healthy and hydrated. Made with Silk Peptide Powder which consists of 18 silk amino acids, and nutrient-rich Freshwater Pearl Powder to enhance elasticity and luminosity while promoting healing. Pearl Powder is enveloped with essential minerals and amino acids, high levels of magnesium, absorbable calcium, amino acids, 30 trace minerals, antioxidants, vitamins, protein, taurine, peptides, and potassium. This Premium Voluptuous Cream absorbs quickly without feeling greasy or sticky, and Replenish skin with soothing Organic Aloe Leaf Juice, moisture rich Organic Coconut and Jojoba Oils, Grape and Avocado Oils, plus nourishing Vitamins A, B, C, D, & E, and Organic Neem, making this silken pearl creme a royal treat that’s not to be missed. Pearls are an excellent source of calcium carbonate and calcium phosphate, the highest concentrations of elemental calcium, and most absorbable that easily pass through cellular membranes or your skin. Using cutting edge biotechnology, pearls are granulated into micro molecular particles to easily and efficiently melt into skin. Real Silk Peptide Powder (hydrolyzed silk protein) imparts luxurious glide and slip, while helping to boost moisture binding abilities, increase absorption, and give even the driest skin the look of a lasting supple, silken sheen. This cream will make your skin as tender and soft as silk, leaves an incandescence glow of the pearl, and restores elasticity and suppleness. Slip into this smooth as silk pearl hydrating moisture veil and discover the power of real Silk Peptide & Pearl Powder. Excellent as a hydrating facial moisturizer, sits perfectly under make-up, or use it as an indulgent full body massage creme. Fast-absorbing, non-greasy lotion nourishes dry, itchy skin, providing refreshing hydration. Formulated for daily use, to elevate and lock in skin’s moisture. THE MAGIC! Pearl and Silk create ultimate skin softness & suppleness. This suculent cream is formulated for all skin types, even sensitive skin. The pearl powder and silk protein in this luxurious formula, gives your skin a beautiful luminosity, a heavenly glow, and leaves your skin feeling deliciously supple. Experience the healing, beautifying and rejuvenating powers of luxurious Freshwater Pearl Powder and Silk. Directions: Apply as needed, night or day after cleansing your skin. Allow 2 minutes for the product to absorb into your skin and set before applying cosmetics. Pearl Powder, Organic Aloe Leaf Juice, Organic Coconut Oil, Emulsifying Wax, Stearic Acid, Glycerin, Organic Jojoba Seed Oil, Grape Seed Oil, Avocado Fruit Oil, Witch Hazel Water, Vitamins A, B, C, D & E, Sunflower Seed Oil, Phenoxyethanol, Hydrolyzed Silk Peptides, Organic White Willow Bark Extract, Organic Neem Seed Oil, Organic Rosemary Leaf Extract, Organic Sunflower Seed Oil, Organic Alcohol, Xanthan Gum, Tetrasodium Glutamate Diacetate.